The definitive guide to raising girls from international best-selling and much beloved parenting author, Steve Biddulph. Steve Biddulph's Raising Boys was a global phenomenon. the first book in a generation to look at boys' specific needs, parents loved its clarity and warm insights into their sons' inner world. But today, things have changed. It's girls that are in trouble. there has been a sudden and universal deterioration in girls' mental health, starting in primary school and devastating the teen years. 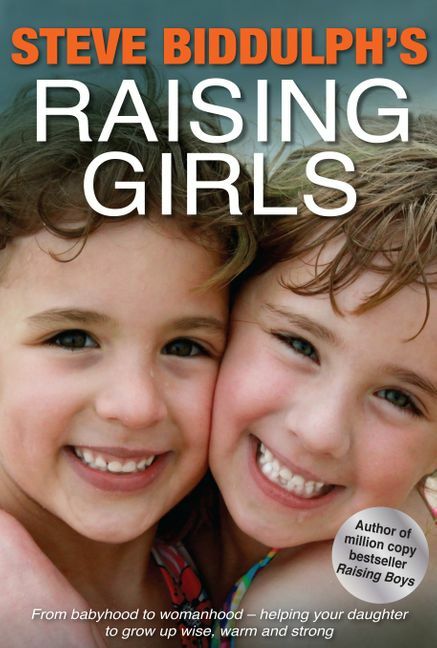 Steve Biddulph's Raising Girls is both a guidebook and a call-to-arms for parents. the five key stages of girlhood are laid out so that you know exactly what matters at which age, and how to build strength and connectedness into your daughter from infancy onwards. Raising Girls is both fierce and tender in its mission to help girls more at every age. It's a book for parents who love their daughters deeply, whether they are newborns, teenagers, young women - or anywhere in between. At last, there is a clear map of girls' minds that accepts no limitations, narrow roles or selling-out of your daughter's potential or uniqueness. Steve Biddulph's Raising Girls explores how to help your daughter feel secure, become an explorer, get along with others, find her soul, and become a woman. All the hazards are signposted - bullying, eating disorders, body image and depression, social media harms and helps - as are concrete and simple measures for both mums and dads to help prevent their daughters from becoming victims. Parenthood is restored to an exciting journey, not one worry after another, as it's so often portrayed. Steve includes many of the world's leading voices on girls' needs and makes their ideas clear and simple, adding his own humour and experience through unforgettable stories. Even the beautiful and moving illustrations, by Kimio Kubo, provide unique and moving glimpses into the inner lives of girls. Along with his fellow psychologists worldwide, Steve is angry at the exploitation and harm being done to girls today. With Raising Girls he strives to spark a movement to end the trashing of girlhood; equipping parents to deal with the modern world, and getting the media off the backs of our daughters. Raising Girls is powerful, practical and positive. Parents will be strengthened by its message.